Our Open Minds Book Club session with facilitator Dr. Etee Bahadur saw the participants ruminating over the philosophy and ideals of artist Somnath Hore. We picked his translated autobiographyMy Concept of Art and his social document on the peasant uprising in Bengal titled Tebhaga to bring to the fore his ideas on art, his quest to find meaning in his works, his source of inspiration and his overall perspectives in the creative/artistic domain. The first book My Concept of Art which charts out the artist’s personal journey, rummaging through the odds of the times in Bengal, with Hore finding his own feet through the language of his drawings while oscillating from Calcutta to Delhi and finally Santiniketan. The artist’s tryst with Socialist ideology and the underpinnings of that same ideology which finds semblance in his works is much highlighted in the course of the book. His engagement with the Communist Party and the manner in which it framed his own odyssey as an artist is beautifully expressed by the translator. The second book Tebhaga which is Somnath Hore’s personal diary documenting the crest and trough of the peasant discontentment in the Tebhaga Movement. Somnath Hore’s diary covers 12 days of the movement catching pace through the eyes and sketches of the artist. He encapsulates the revolutionary fervour and solidarity of the peasantry that he had never witnessed from such close quarters before. Both in his writings and the sketches that he makes, he records the happenings without any concerted attempts to ‘abstract or distort’ reality. His vision of ‘wounds’ is synonymous with the way he perceived the overall experience of the Tebhaga Movement and the manner in which it evoked a sense of memory intercutting through the past metaphor leaving the impression of a wound which was created by a betrayal, surpassing moral grounds. As the discussion progressed, it entailed cutting across both the books as one is about his philosophy and evolution as an artist while the other book complements his learnings in the course of his odyssey. Participants discussed his relationship between politics and art. Sarika brought up the idea of the ‘instinctive medium’ that Somnath Hore talks about which in his case would be wood carving. She opined about the difficult choice of medium made by the artist. Hima and Mamta deliberated and pondered upon with our facilitator about the element of empathy required in an artist to propel such kind of works.They all partook in an exchange of thoughts around the empathetic approach of Somnath Hore in his work. Sancheta made a poignant observation that every work of art has it’s own journey in the road of recognition. 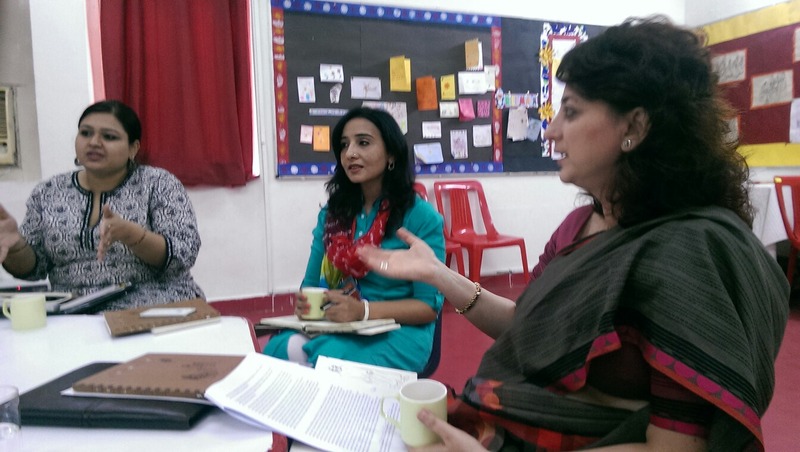 Hima, drawing inspiration from the book observed that one has to engage with ‘experiments’ to bring about affirmative change.The discussion ended on a high with teachers exchanging their thoughts on employing the element of wonderment as a priority while imparting education to students.